Today I had the opportunity to tour the control tower at the Cincinnati Lunken Airport. I have been watching the "Learning to Fly" series on Discovery Wings and in a recent episode the CFI and student took a tour of the tower to better understand how the control tower works. The theory was that by meeting the people in the tower and learning more about what they do it would make the student more comfortable communicating with them. I decided I too wanted an opportunity to see the inside of the control tower at my airport. I was not sure how easy it would be to get in touch with the right person about taking a tour. I submitted a post on StudentPilot.com asking if others had taken control tower tours. Consensus was that it was a great idea to take a tour and could probably be accomplished by simply calling the main tower number and asking for a tour. When I called, the tower manager was more than happy to offer me an opportunity to see the facility. 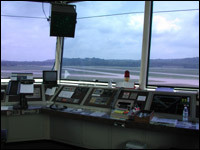 Today I stopped in and talked with him for about 15-20 minutes then went up to the main control tower room. There I met two controllers, one in charge of ground communications (for taxiing) and another that handled takeoff and approach clearances. I was amazed at how open they were to sharing with me what they do. They spent time explaining how they can read their radar scope and learn the location, altitude and speed of an aircraft. The controllers walked me through some more of their many duties in addition to managing traffic, such as recording the ATIS weather report (Automatic Terminal Information Service) used prior to taking off. This helped me put in prespective some their responsibilities other than simply manageing aircraft flow. So pilots, be patient when the control tower takes a moment or two to get back to you. One of the most interesting things I learned was that this facility is privately managed. The government started privatizing smaller towers in order to save money. The Lunken Tower is managed by Midwest Air Traffic Control, Inc. The FAA will not hire Air Traffic Controllers over the age of 32. So, retired military controllers do not have the opportunity to work for the FAA towers. But since the move to privatize towers many of them have found employment with small to mid-size towers such as Lunken. Of the seven tower employees at Lunken, at least four are former military controllers. All-in-all it was an eye-opening experience that I recommend every pilot take advantage of. In departing, the controllers continually expressed that I should encourage other pilots to take the tour. So get out there and learn more about your fellow airport inhabitants. Replica Watches UK, Swiss Fake Rolex Watches Sale!